New Right chairwoman criticizes Blue and White party, says they should come out and declare that they're leftists. 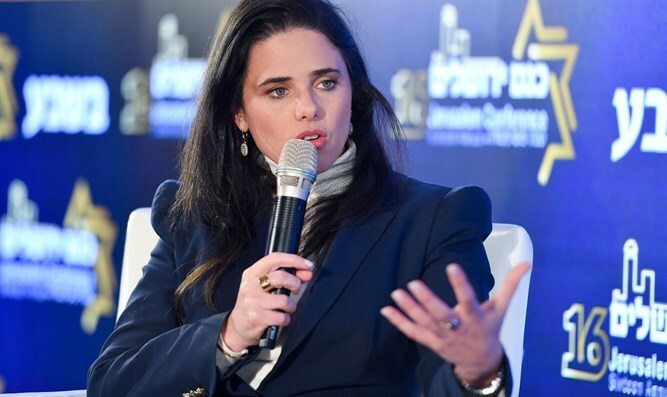 New Right chairwoman and Justice Minister Ayelet Shaked took part in an election event in Kochav Yair-Tzur Yigal on Saturday night. “By the way,” continued Shaked, “our party has two women in the first three spots on the slate and five women in the top ten. In the Gantz party there is no woman in the first five spots." She pointed out, "What counts is the bloc. The balance between the blocs has not changed. Netanyahu will definitely be the prime minister, the question is which government he will form and that’s up to you - how many seats will we get?"